We have found that Steve is a versatile man. 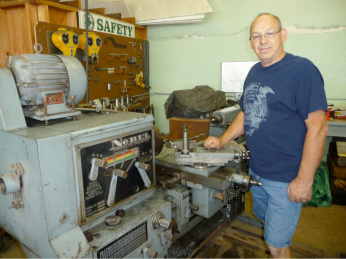 He can wire as an electrician, work as a machinist, paint, grind and leave a tidy work area. But Steve shines as a mechanic and the shop has always been grateful for an experienced volunteer mechanic. Steve came to us with years of experience, an AA degree from Weber University in diesel mechanics and a willingness to get his hands dirty. Steve grew up in Keyser West Virginia near the Baltimore and Ohio R.R. He claims no relatives who worked on any railroad and his first train ride wasn’t until 1969. He graduated from the B & O railroad school for clerks where he learned that he really wanted to get grime under his fingernails and not paper cuts. In 1987, Steve hired on at Hill Air Force Base as a civilian mechanic for the Army/Air Force railroad operations. He added to his duties the coordination and transfer of surplus rolling stock to the Union Station. In addition to his U.S. Army/Air Force experience he can claim experience as a heavy equipment mechanic with the Southern Pacific R.R. All this experience caught the eye of Steve Jones who figuratively grabbed Steve by the arm in 2013 and dragged him into the shop for work on the 223, speeders, diesel locomotives and anything that comes our way designed for the betterment of the Union Station and the community.